Mount Pulag in Luzon, bordered by Ifugao, Nueva Viscaya and Benguet, may not be the highest mountain in the Philippines. However, its beauty is so breathtaking that many mountain lovers - both foreign and local - keep going back to experience its grandeur surrounded by wonderful nature! #1 - It is the third highest mountain in the Philippines: Standing tall at 2,922 meters above sea level, Mount Pulag is Luzon’s highest peak, and the country’s third, in comparison with Mount Apo (2,952 meters above sea level) in Davao, Mindanao and Mount Dulang dulang (2,941 meters above sea level), that is found in Bukidnon, Mindanao. #2 - The clouds look like the ocean: is visible at the summit of Mount Pulag although there are times when it cannot be seen. Nevertheless, mountain climbers there are always awe-inspired just by their mere presence on top of this majestic mountain. Why? Because the sunrise is so amazing, not to mention the extreme coldness one can feel while there as if in winter season! Indeed, Mount Pulag is not the country’s most famous for no reason! #3 - You can see the Milky Way Galaxy at night: Want to see the other side of our world? 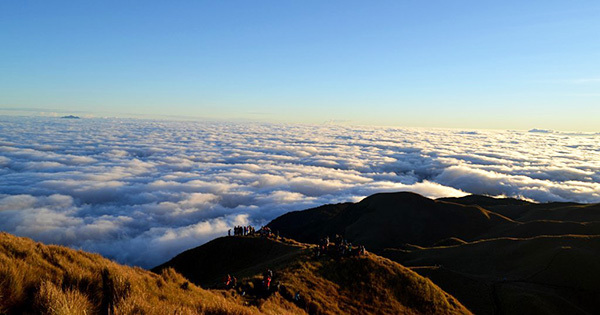 Then head onto Mount Pulag, where the Milky Way Galaxy can be gazed at by dawn. This sight is so picturesque you will feel as if you have stepped out of the Earth as an astronaut. The only difference is you wouldn’t need a space ship! Just a quite tough jeep ride that is all well worth it as your reach Mount Pulag’s highest peak with pride! #4 - There's a hanging coffin: Another out of this world sight at Mount Pulag are no less than the hanging coffins which can be found at Kabayan mummy burial caves – inside are the dead of the Ibaloi people who come from the province of Benguet. This part of Mount Pulag is considered a Philippine cultural treasure that is part of your mountain climbing adventure there … so unique, eh? #5 - It's one of the country's National Parks: Because of the outstanding vegetation and wildlife present in Mount Pulag, the Philippine government turned it into a National Park in order to protect these natural assets as well as the different ethnic groups that live there, such as the Ibalois, Kalanguya, Kankana-eys, Karao, Ifugaos and Ilocanos. You might just come across these wonderful people when you go there so say, hello! Or “Kumusta po? “ (A polite way to greet Filipinos in their vernacular language, which means, “How are you? In English). Cheers!